IBPS RRB is a post in rural area banks which are further subcategorized into many sub posts. IBPS conducts this exam so that all vacant posts will be recruited in rural banks. Institute of banking personnel selection (IBPS) committee conduct this exam in five slots so that all interested and eligible candidates may read IBPS RRB Officer Scale 1 Exam Analysis 2016. This exam analysis will be helpful for recruiting the eligible and deserving candidates. ❤IBPS authorities conduct Slot 1: 9:00AM to 9:45 AM, Slot 2:11:00 AM – 11:45 AM exam only through online mode and you must give mock tests so that you will able to give the online exam. IBPS RRB exam will be done in two phases: the first one is preliminary exam and second is the main exam. The main exam of IBPS will be given by candidates who has cleared the preliminary exam with required cut off score. RRB post preliminary exam has been scheduled on 6 November, 2016. ♛More than Lacs of candidates have appeared for this exam on 6 November, so 5 slots created on that particular day. As we know, in this exam, questions were from quantitative aptitude(Easy-Moderate) and reasoning(Moderate) . ✈Out of 40 questions, 27 to 30 questions were easy to moderate level and if you prepared well for this exam, then you can easily clear cut off marks for this section. ✈Questions asked for approximation, number series, pie charts, graphs and tables were easy and candidates attempted all such questions. Quadratic questions and miscellaneous questions somewhat difficult and candidates take a long time for solving such questions. ✈Approx 40 % to 50 % candidates did not attempt question from miscellaneous topics. Q1. 3, 1.5, 1.5, 2.25, 4.5? 2, 4, 11, 37, 153? 9, 14, 21, 32, 45? 4, 4, 6, 12, 24? Q2. 2, 7, 14, 25, 38? 6, 6, 8, 14, 26? 3, 5, 13, 47, 177? 4, 2, 2, 3, 6? ✌In reasoning section, the level of question was moderate. ✌Questions for syllogism and inequality were so easy while questions for puzzle were difficult and many of candidates face some problem while solving puzzle questions. ♣Q.1 Statement 1: All hunters are punters Statement 2: Some punters are tigers. 1. Some Hunters Are tigers. 2. All Tigers are punters. 3.. Some Punters are hunters. 4.. No Punters are hunters. 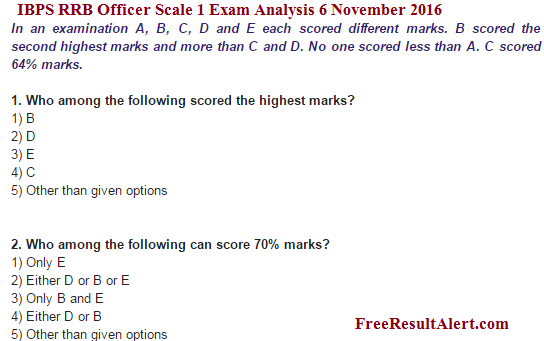 ❣From the overall analysis of all 5 slots, we can say that for clearing this IBOS RRB prelims exam for Officer Scale 1 post, your 50 + questions must be correct. You must have to check your result on the official site so that you may start preparation for the main exam if you have read IBPS RRB Officer Scale 1 Exam Analysis 2016.